Type “artificial sweetener” into any Internet search engine and expect to be inundated with a barrage of false claims. These unsubstantiated side effects include (but are certainly not limited to): anxiety, blindness, obesity, suicidal ideation, epilepsy, Alzheimer’s, multiple sclerosis, hypothyroidism, chronic fatigue, personality changes, elevated blood pressure, migraines, hypoglycemia, menstrual abnormalities, and “irreversible brain damage.” Yikes! Still with us? Numerous studies have investigated the supposed link between consuming fake sugars and suffering from these symptoms, but few have found any direct links. Yet accusations that sugar substitutes are the root cause of countless health problems pervade. But is there actually a cause for concern? And how can we be sure? Like any flavor enhancer, artificial sweeteners only sneak into snacks, beverages, and other goods after passing a rigorous approval process conducted by the FDA. Based on reviews of its chemical and all existing research into its effects on animals and humans (i.e. whether its toxic, could possibly cause cancer, or could cause the growth of extra limbs), scientists determine how much of a sweetener humans can safely consume on a daily basis — a measure known as acceptable daily intake, or ADI. The FDA (or other regulatory agencies) typically draws this line 100 times below the dose at which a substance could actually cause harm. So not only are we dealing with a huge safety margin to begin with, we’re talking daily consumption over a lifetime — a fair bit more than the amount we could consume during a one-time synthetic sugar binge. There are four artificial sweeteners currently on the U.S. Market: aspartame, acesulfame potassium, saccharin, and sucralose. And a new sweetener, by the name neotame, just received FDA approval and will soon join the ingredient lists of many low-cal and diet products. Ordered from lowest to highest ADI, here are the most commonly used artificial sweeteners on today’s U.S. market. Over 300 times sweeter than regular sugar, saccharin is one of the oldest and most widely studied artificial sweeteners. Chemist Constantine Fahlberg first discovered the stuff in 1879 when, after a long day at the lab, everything he touched at dinner suddenly tasted sweeter. Despite heavy criticism, the FDA has approved saccharin on multiple occasions. Warning labels were placed on all saccharin-containing products between 1997 and 2000 while the substance underwent further FDA review in response to concerns that the stuff could cause tumors in humans. As soon as the science proved these concerns to be silly, all warnings were removed. Where it’s Lurking: Chewing gum, diet soda, jams, salad dressings, candy, canned fruit, baked goods, some vitamins and pharmaceuticals, and cosmetics. Over 100 studies have confirmed sucralose’s safety since it was created in the late 1960s. And it’s considered pretty darn safe! In one study, rodents exposed to 16,000 milligrams of sucralose per kilogram of their body weight per day — the equivalent of a human chugging 16,000 cans of diet soda (!?) — showed no significant side effects. Nor did a group of diabetic people who consumed 500 milligrams of the stuff per day. Where it’s Lurking: Yogurt, protein bars, frozen deserts, syrups, baked goods, and diet beverages. Another accidental discovery, this sweetener gained approval in 1983, a couple decades after German Chemist Karl Claus just so happened to lick his chemically-doused fingers in a lab one day to discover the compound. (Sound familiar, saccharin?) 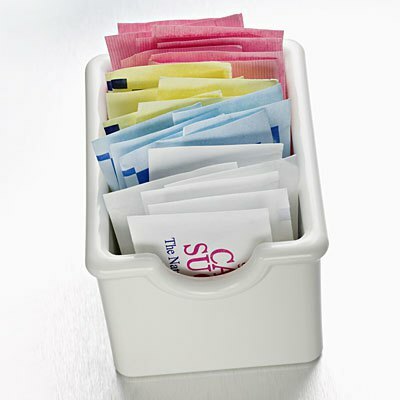 Rather than standing on its own, acesulfame potassium (200 times sweeter than regular sugar) is usually combined with aspartame or saccharin to enhance the flavors of low-cal treats and mask other artificial sugars’ bitter aftertastes. Where it’s Lurking Soft drinks, diet iced teas, tabletop sweeteners, candies, and chewing gum, marinated fish (wait…), rice pudding, ice cream, yogurt, and pickled vegetables (huh?). See also: toothpaste, mouthwash, and some medications. Surpassing saccharin as the most extensively researched and widely used artificial sweetener, aspartame was also discovered by a chance finger-lick. (Clearly we’d be on different career paths had we also blatantly ignored chemistry 101’s lab rules.) Aspartame, which can taste up 220 times sweeter than natural sugar, entered the mainstream market after gaining FDA approval in 1974. It was reapproved in the early 1980’s after additional studies disproved numerous claims over its adverse health effects. Where it’s Lurking Aspartame is currently used in over 6,000 American products, ranging from soft drinks and candy to yogurts, deserts, fruit spreads, nutrition shakes, protein bars, cereals, gum, and some pharmaceuticals. A close cousin of aspartame, this flavor enhancer clocks in with a sweetness between 7,000 and 13,000 times that of regular sugar. Yeesh! Neotame withstands higher temperatures and has a longer shelf-life than aspartame, and it’s been proven safe in a number of clinical trials conducted in mice, rats, dogs, and rabbits. NutraSweet holds a patent for the stuff, and it’s been gaining steam in India under the brand name Sweetos. By and large, the major claim against artificial sweeteners — that they cause cancer — has been disproven. Several studies have found higher incidences of bladder cancer in rats whose chow was pumped full of aspartame. But we’re talking the human equivalent of 2,500 to 5,000 milligrams per kilogram of body weight per day — way above aspartame’s ADI and well over the typical amount of aspartame an average American is thought to consume. Plus, humans don’t as readily form the potentially cancer-causing calcium crystals that rats do after breaking down artificial sweeteners (and other substances). (As it turns out, overloading on vitamin C is just as likely as swallowing too much saccharin to trigger bladder cancer in our rodent friends. The second biggest cause of sugar substitute debate? Whether or not they can cause weight gain. Research into this claim’s validity is still a bit iffy. While some studies suggest artificial sweeteners screw up our brain’s ability to gauge how many calories are in non-diet foods, others have found associations between long-term consumption of diet sodas and some seriously expanded waistlines. However, most emphasize a lack of proof that artificial sweeteners are the true culprits behind obesity. Since diet sodas and snacks are so widely consumed, the chances are pretty high that just about anything else (like ordering a Big Mac to go with that Coke Zero or counting TV remote clicks as exercise) could be the real source of the pudge. Though all five currently produced artificial sweeteners have met (and surpassed) the FDA’s current safety standards for food additives, there’s no definitive guarantee that these products will never be found to pose health risks. The formerly-legal sweetener cyclamate, for instance, was banned from incorporation into foods, beverages, and sweetening tablets after a study found it to be toxic to some animals. Though, word to the scientifically wise: Subsequent studies have not replicated the tumor-cyclamate link. But, like most things, artificial sweeteners come with legit cons and pros. On the plus side, they can help keep caloric intake under control, reduce insulin spikes and post-sugar binge crashes, make medicines and oral hygiene products less bitter, and boost yumminess in some food and beverages. On the other (not so plus) side, they don’t provide any vitamins, minerals, protein, fiber, or healthy fats. It’s no news that weight control and overall health maintenance involve more than just cutting calories. Optimal wellbeing means incorporating a range of non-processed and proven-to-be-good-for-you options into your daily diet—think: veggies, fruits, lean protein, fish oils, and whole grains. Not to mention adopting a healthier lifestyle that includes regular physical activity and adequate sleep. In turn, while the vast majority of us may not be adversely affected by sugar substitutes, some may have their own issues. One genetic disorder, for instance, renders sufferers unable to metabolize one of aspartame’s metabolic byproducts, the essential amino acid phenylalaline. Many folks may also have specific allergies to artificial sweeteners, much like they would to a variety of foods or chemicals, so be your own sleuth. If you get hives after drinking diet soda on multiple occasions, try taking a break from the Pepsi Maxx and speaking with a doctor. No one’s recommending a diet of Equal packets and Powerade Zero — just because non-nutritive sugar substitutes aren’t so bad for you after all doesn’t mean they’re good for you. But until sufficient evidence crops up that any of the above sweeteners do pose a significant risk to human health, there’s no scientifically sound reason to take them off the market — or to completely eliminate them from your diet. Originally published on July 19, 2012. Updated July 2013.